If you’ve been excited about this year’s WordCamp Europe, you’re not alone! The event is nearly here and we couldn’t be more stoked about it! The WordCamp Europe organizing team was very nice to share the numbers from the past editions with us, so we’ve put them all together into this single infographic. We know you guys love visuals, so we hope you will enjoy our work! #WCEU 2018 will be the biggest one to date! 60 speakers approved for #WCEU 2018! Will #WCEU 2018 go over 500 contributors? There were several stats that we were seeking for this infographic, which we managed to cover actually: from the participating countries to volunteers, organizers, live streaming, fun events introduced yearly, the location of past editions, speakers, and other interesting facts about WCEU. 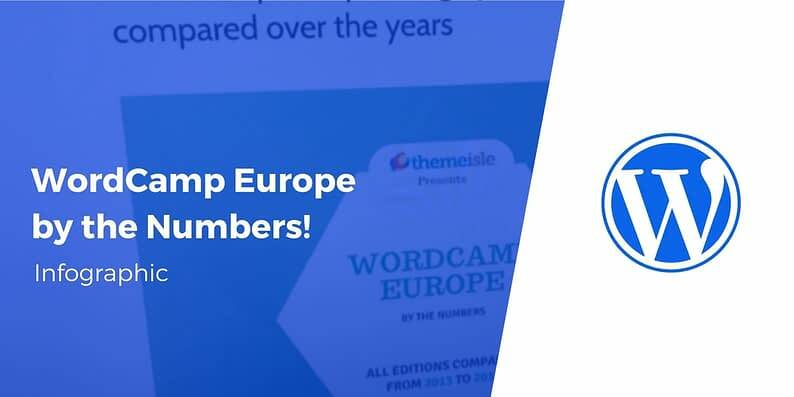 So… how did WordCamp Europe evolve since its premiere in 2013? Have a look at this infographic and see for yourself! By the way, if you’re not done with the preparations for Belgrade yet, you should hurry up because #WCEU will start in a blink of an eye. Don’t forget to check the full schedule for #WCEU 2018 here. What do you think about these numbers? Is #WCEU becoming stronger and stronger every year? Hint: Best way to use this infographic? Email it directly to people who might be interested (use this link https://themeisle.com/blog/wordcamp-europe-by-the-numbers/). The number of the participating countries is rising every year. People are coming from all around the world, not only Europe. The number of contributors has tripled since 2013. The number of volunteers also tripled. #WCEU organizers … it all started with just 11 people, now they are 57. The organizers are grouped into 10 teams: Sponsors, Communications, Community, Attendee Services, Volunteers, Design, Public Relations, Content, Local, Photography.